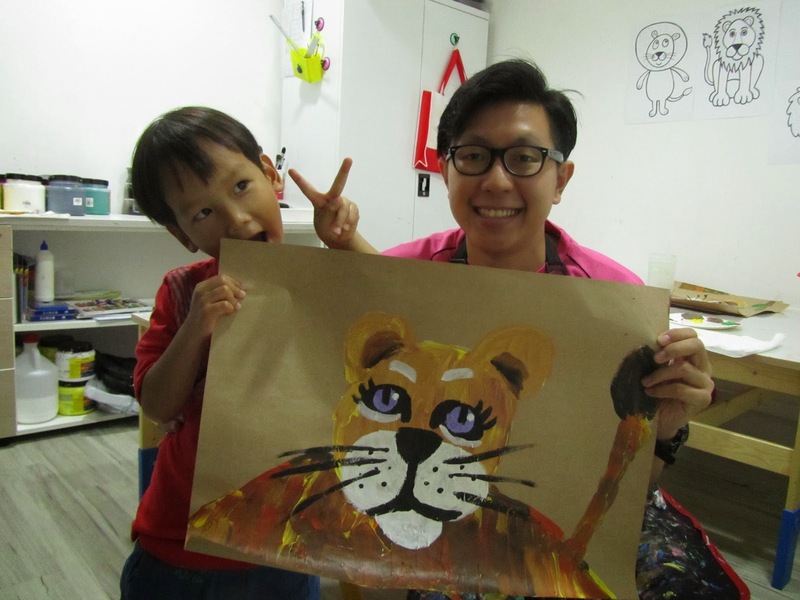 Our 4yo Z surprised us one afternoon after he returned from art class. He had a special glow in his eyes and he looked as if he was bursting to say something. 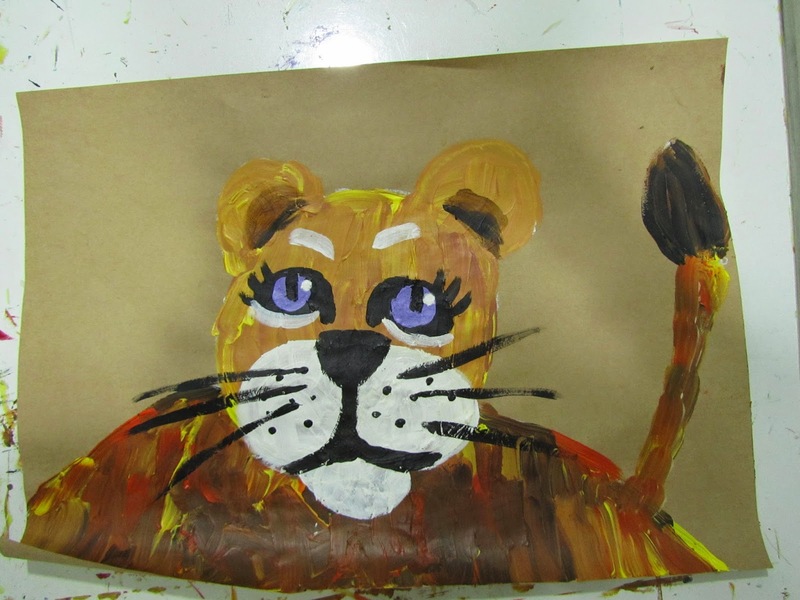 "I drew a girl lion," he said calmly. Her name is "Wymba". And we were all eager to hear the details. 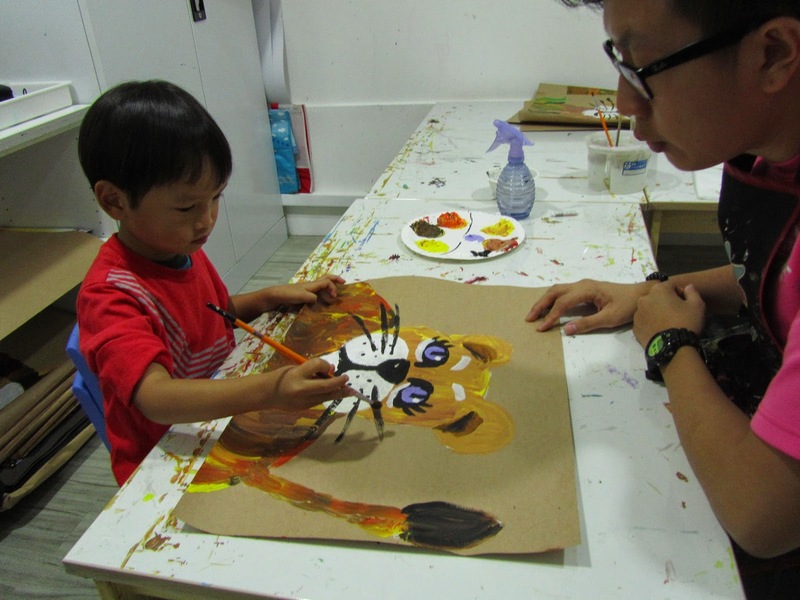 That Wednesday, Z's grandparents had sent him for his weekly art class at heART Studio, and they shared over the phone that he was very focussed and had painted a most impressive lion. So when Z returned home we were all excited to learn what happened. 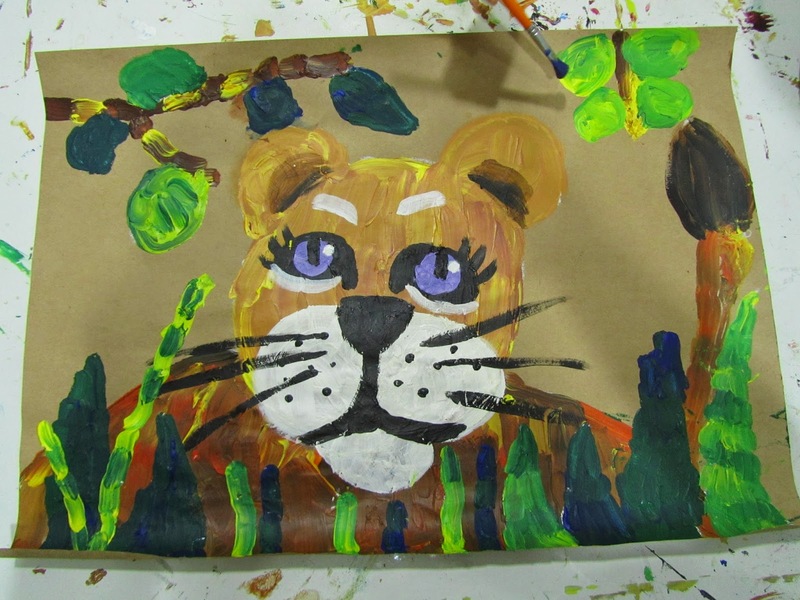 Unfortunately, Z was still in the process of doing the painting, and as such wasn't able to bring it home that day. Z was completely concentrating on his work. The news of Z's progress was music to our ears. 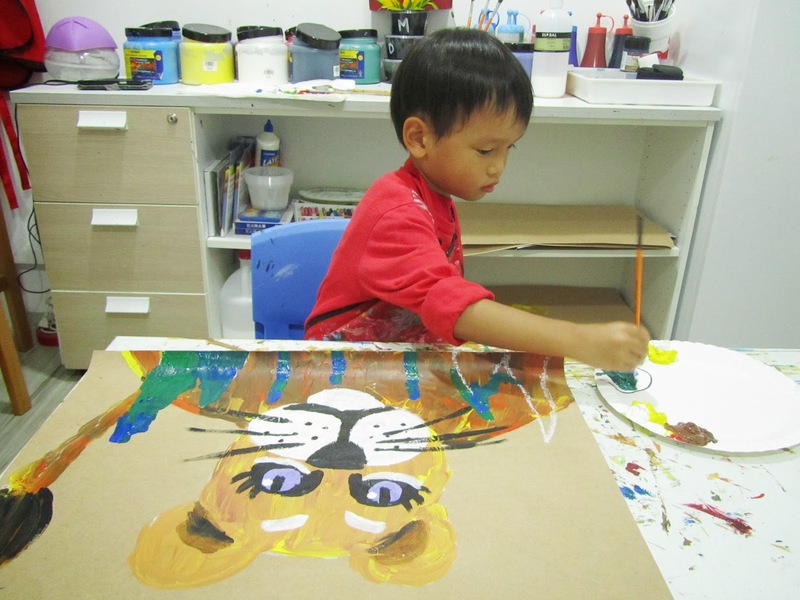 He has been with heART Studio for quite a number of weeks, but there have been moments when he had not been able to focus. 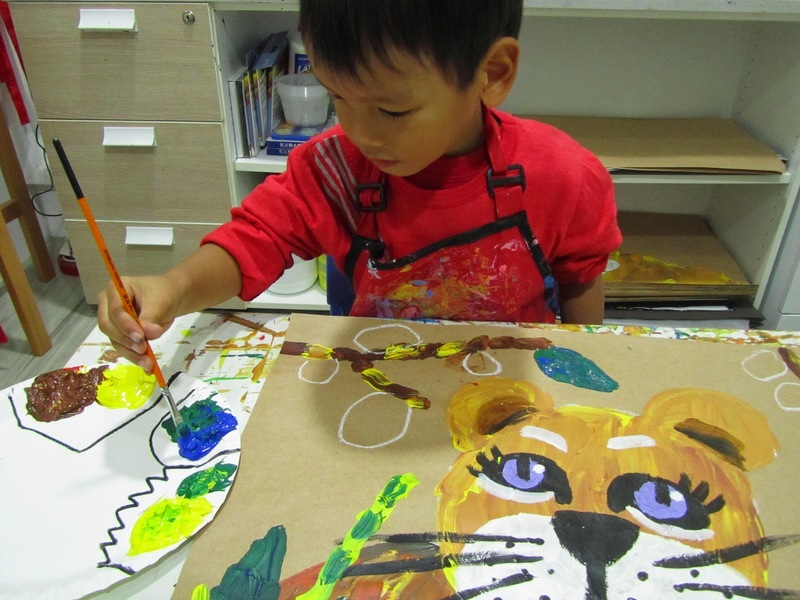 Teacher Jay from heART Studio has however been very patient with Z, and it now seemed that our son was finally able to spend a longer time concentrating on his work. 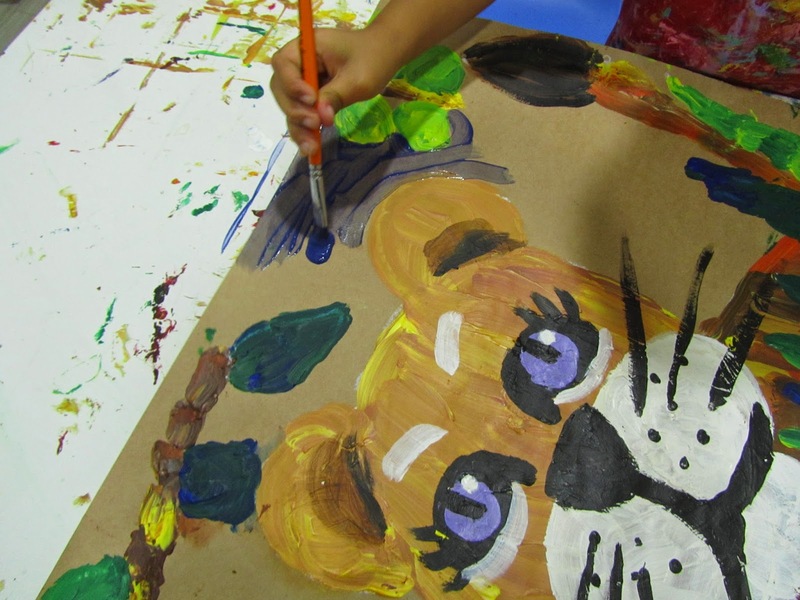 The children are focussing on animals this term. 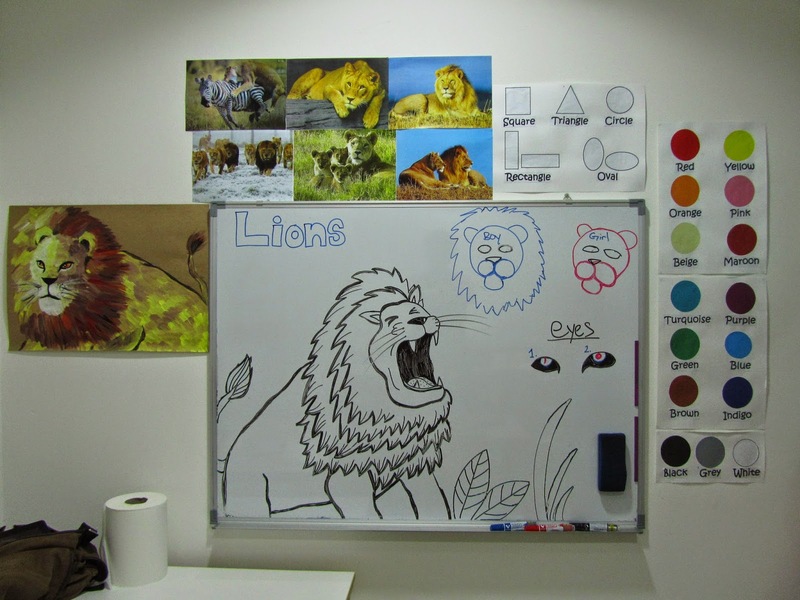 heART Studio teaches children how to draw animals using shapes. Little Z looking rather contented with the progress so far. Adding the finishing touches for the main body of the lion. 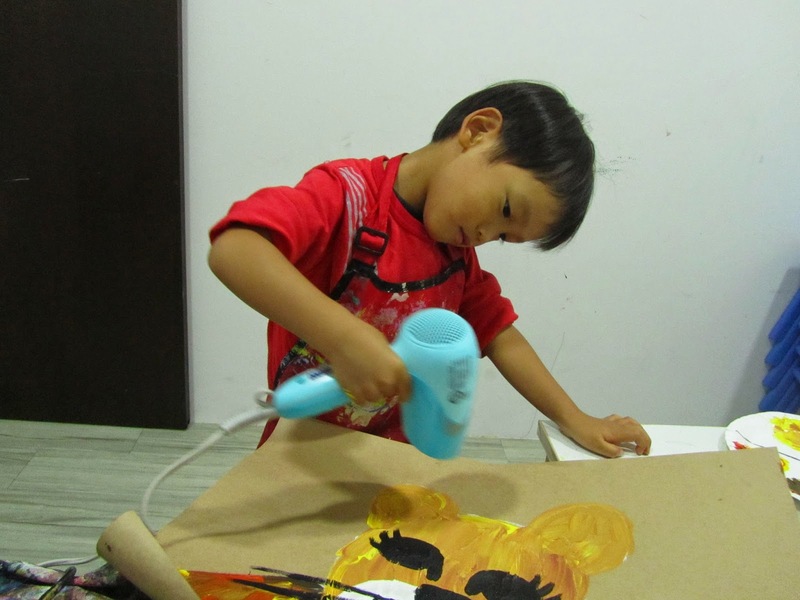 Our little one quite enjoyed using the hair dryer for his painting. Finishing part one of the process. A very happy Z with his dedicated teacher. 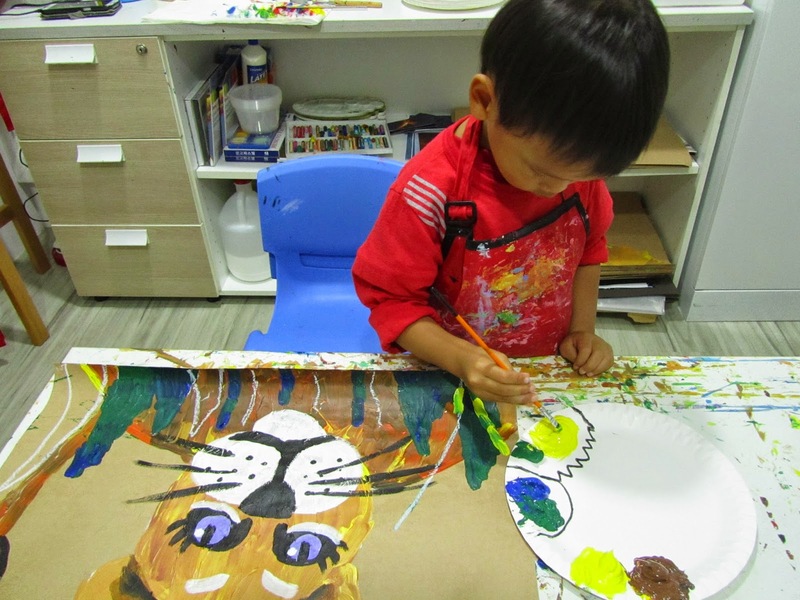 Z was all ready to take the painting home, but his teacher had grander plans for him. 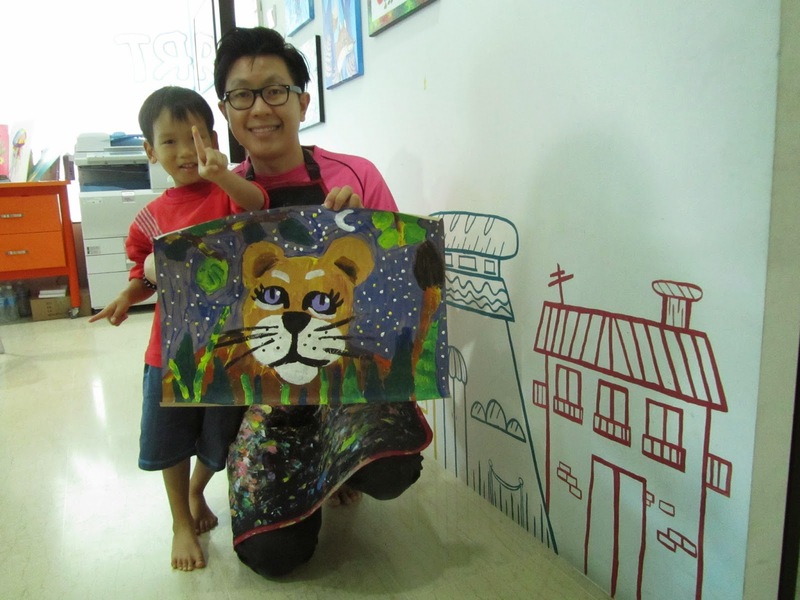 Apparently the painting was not yet completed; the best was yet to come! Starting on part two of the painting - the background. Z learning to blend colours. We were wondering why Z was able to keep to the lines and not mix all the colours together. A choice of cool colours for the foliage, to create the peaceful effect of the jungle. 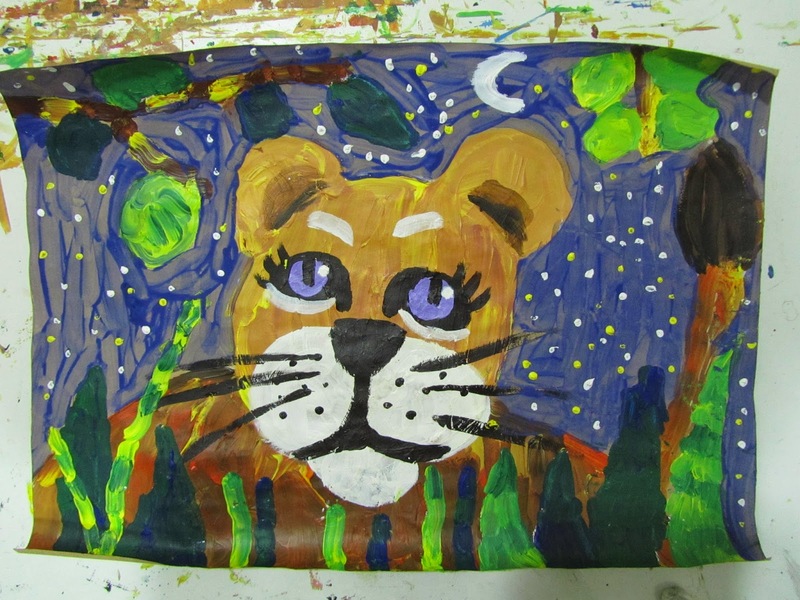 The finished product - Say hi to "Wymba the Lionness!" Z and his beloved Teacher Jay. 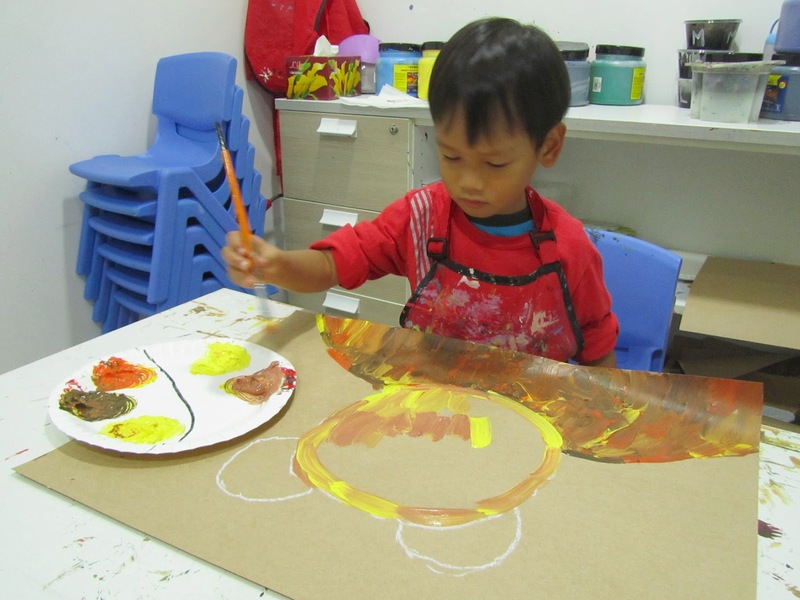 We are so thankful to heART Studio for investing in our son. We know he is a better person because of his experiences there! 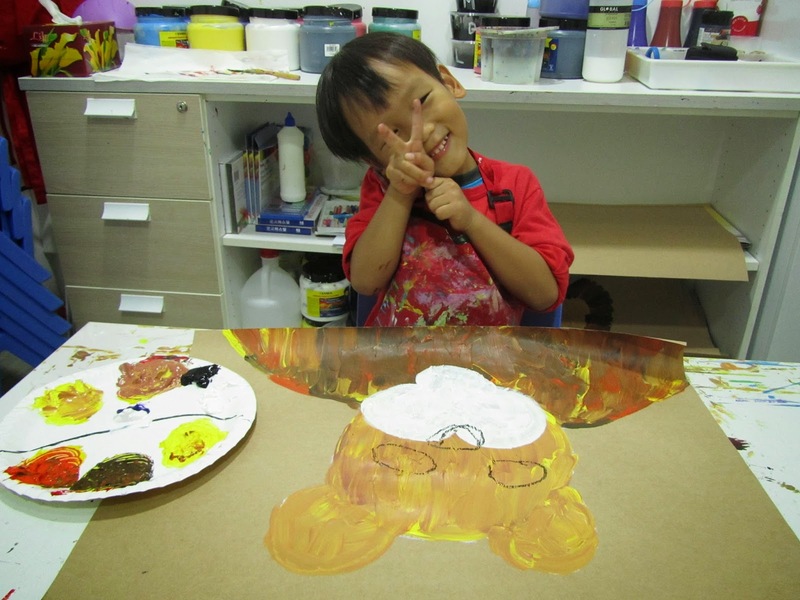 You can read about Z's first art class at heART Studio here. Z continues his art journey here.